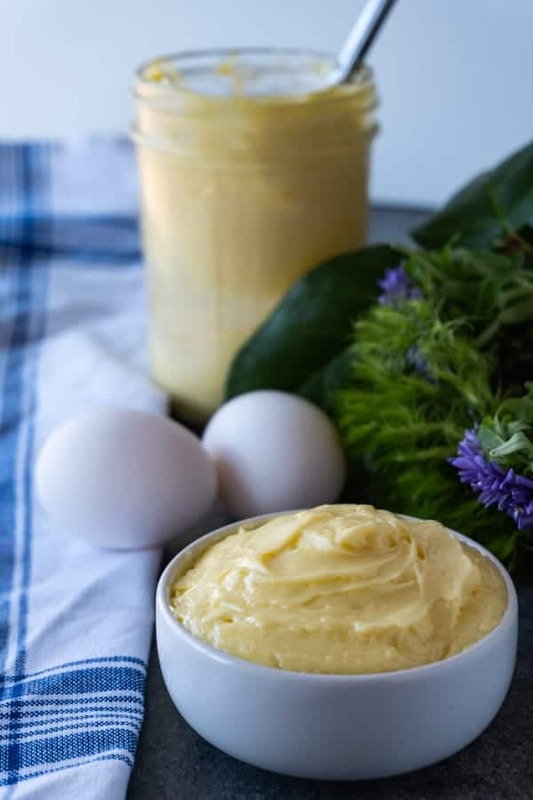 Homemade Mayo is easy to make and extra delicious! 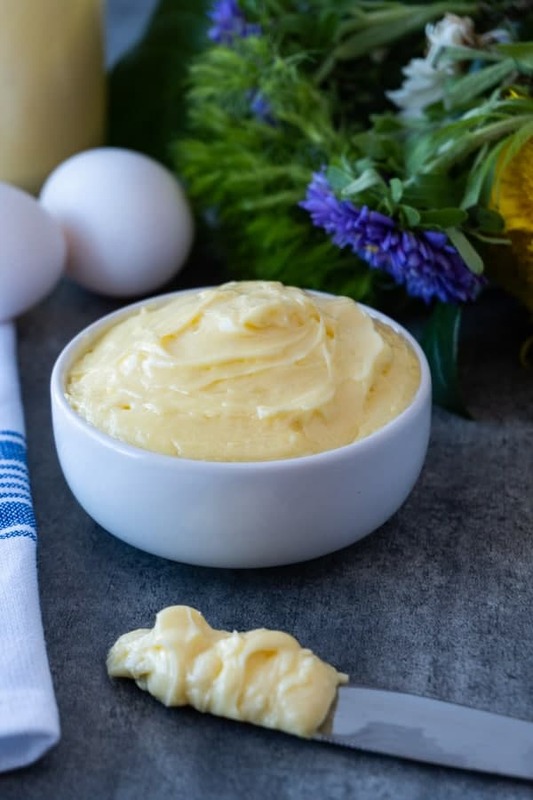 You won’t want to go back to store bought after making your own homemade mayo! Growing up I didn’t like mayo- it just wasn’t my cup of tea. Until I started eating healthier and trying to make things on my own is when I realized I really wanted to try homemade mayo. Once I realized that all mayonnaise is is egg, lemon juice, salt, and oil the mysterious weird white stuff was actually appealing and seemed like a good source of healthy fat. I’ve tried a number of different recipes all with very similar ingredients but different techniques and at first I was quite disappointed. Some recipes use 2 eggs, some used 1, some used avocado oil, others light olive oils. Some recipes even called for allowing all the ingredients to come to room temperature before attempting to make it. I’ve tried all these ways and have had many failed broken mayos but have finally figured out a method that works and works well. 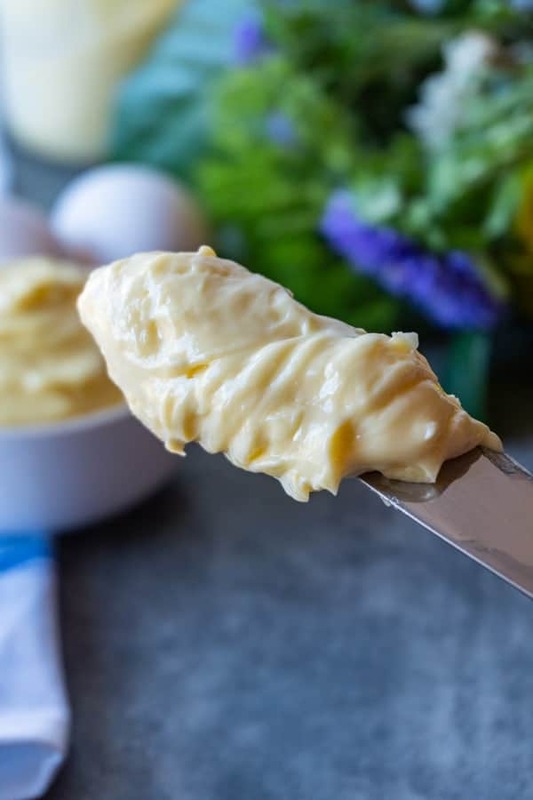 My homemade mayo is thick, smooth, and perfect for a sandwich or egg salad! Sometimes I even dip my fries in it- it’s that good. This mayo is paleo, whole30 approved, and keto friendly but overall it just tastes delicious! Now-a-days I rarely end up with a broken mayo but it does happen occasionally and so I’ve also figured out how to fix the broken mayo so it turns into the creamy goodness you were hoping for. Because no one wants to toss all those ingredients and start over! How to make homemade mayo? Stick your immersion blender into the cup and blend until you get mayo! 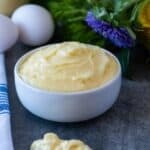 Homemade Mayo Paleo Recipe- so easy and delicious! How to fix broken mayo? All you need to do is add an egg yolk to a new container (or the glass that you tried making the mayo in the first time but the broken mayo removed and put in a separate cup). Turn the immersion blender on and start blending the yolk while slowly pouring in the broken mayo. I like to add a little of the broken mayo at a time, blend completely and then repeat until all the broken mayo is used up. This should emulsify the broken mayo into the yolk and you will get a thick mayo! How long does homemade mayo last? I recommend eating it within a week. Keep it refrigerated and enjoy it on all things tasty like burgers, fries, in eggs salad, and deviled eggs! Why did my mayo break? Why is my mayo not thick? The simple answer is it didn’t emulsify. The oil and egg yolk didn’t combine in a way that thickened the contents but actually stayed separated. This typically happens if the ingredients are mixed too fast (Like if you were to make mayo in the blender but poured everything in too fast). Can you make mayo in a blender? Yes. You are supposed to add the ingredients to the blender except the oil. Turn the blender on and then slowly drizzle in the oil. However, I have not mastered this technique nor do I really care too. The mayo breaks hardly ever (I still don’t have the blender mayo knack down- using a blender my mayo breaks all the time and I always wonder why I didn’t just use my immersion blender). You can put all the ingredients (including the oil!) into the container and blend away- no slow drizzling of the oil. What oil do you use for mayonnaise? I like to use light tasting olive oil, but avocado oil, grapeseed oil, and even canola oil can be used. Just remember whatever oil you do use will affect the taste of the mayo even if only a little. If you like this recipe make sure to check out some of my other healthy recipes like zucchini hash browns, spinach smoothie, and my chicken and spaghetti squash casserole! 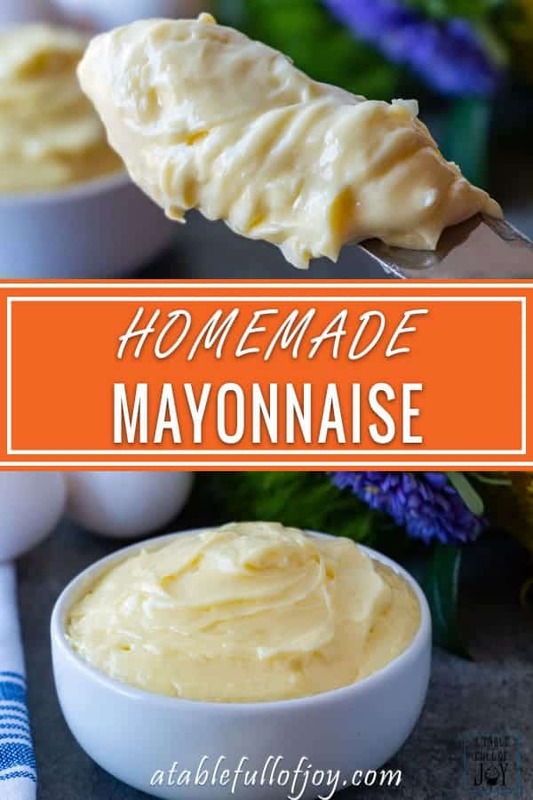 Homemade Mayo is easy to make and extra delicious! Thick and creamy every time! Using an immersion blender blend all the ingredients until fully combined. I like to work the immersion blender in an up and down motion to get everything fully combined. Refrigerate up to a week. *Avocado oil, grapeseed oil, and canola oil can all be used too. If your mayo breaks (aka doesn’t become thick) see my tips on how to fix it in the post above! Images of the ingredients are for a double batch which you can easily do too!